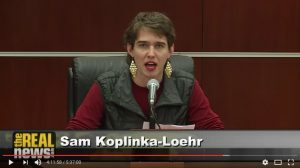 Sam Koplinka-Loehr, served as the Field Organizer and Outreach Consultant of the National War Tax Resistance Coordinating Committee during 2017. Sam has been a war tax resister since the late 2000’s and is a gender queer young adult who is actively involved in long-term struggles for justice. They live in Philadelphia, Pennsylvania. Sam is one of the youngest active members of the national network, at 25, but hopefully not for long! They are working alongside many other people to build a strong movement of radical young people who refuse to pay taxes to our oppressive government and redirect the money to organizing efforts instead. Sam has a bachelor’s degree in Environmental Justice from Middlebury College in Vermont. They have been part of direct action campaigns to stop fracked gas pipelines in Pennsylvania, build prisoner power at Angola Prison, and end police terror in Philadelphia. As the Field Organizer of NWTRCC, Sam was regularly in touch with members of the national network, connecting people to resource as well as helping to plan events and actions. Sam testifying at the Iraq Tribunal sponsored by CodePink, December 2, 2016.